“Biotechnology for Biofuels” is a series of investigations into “next generation” biofuels derived from lignocellulose and algae, including in-depth investigations of three biofuel companies – Algenol, Mascoma, and Solazyme/TerraVia. Policy-makers and industry leaders are pinning their hopes on biofuels and an entire bioeconomy where fuels, consumer goods, plastics, chemicals and materials currently derived from fossil biomass (oil, coal, natural gas) will instead be produced from living biomass (trees, crops, microbes). They mistakenly view this as a solution to climate change. First-generation biofuels from corn, sugar, palm oil and soya are linked to deforestation and land conversion, competition with food, loss of biodiversity, land grabs and human rights abuses; along with reliance upon genetically engineered crops. But we are told that the “next generation” of ligno-cellulosic and algal fuels, made from “non food” biomass, will be better. 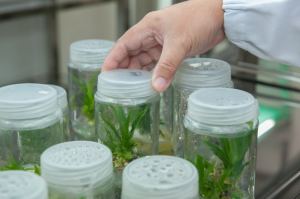 After at least a century of unsuccessful attempts to turn solid biomass into liquid biofuels through the use of heat and pressure, researchers and companies are focussing on biotechnology as key to cellulosic biofuel production and to a wider bioeconomy. This includes the use of potent new biotechnology tools, i.e. synthetic biology (aka “new breeding technologies”). Researchers are engineering trees and crops to produce massive amounts of biomass designed for refinery processes, and are manipulating the genome of microbes, including micro-algae to secrete oils, enzymes and other chemicals of commercial and industrial interest. This is a primary focus of biotechnology, with a massive wave of new patent applications and the lure of large profits. But these engineered organisms are largely unregulated and poorly understood. They pose a serious threat to ecosystems and human health if they are released or escape into nature, which is inevitable. Even after decades of research, there is no commercial production of ligno-cellulosic and algal biofuels. Companies are turning instead to using their genetically engineered organisms to production small quantities of high end consumer goods – expensive cosmetics, flavorings, nutraceuticals and various coproducts to maintain their profit margins. Some genetically engineered microorganisms are also being used to make conventional corn ethanol production more efficient. Taxpayers are footing the bill, strung along by grossly hyped up claims about new technological breakthroughs just over the horizon – breakthroughs that will finally provide a clean, green and sustainable path to “consumerism as usual.” However, there is little basis for assuming that ligno-cellulosic and algal biofuels, if they were to ever be produced on a commercial scale, would in fact represent any improvement over first generation biofuels, since they too require land, water and agrochemicals as well as genetically engineered microbes. Meantime, genetic engineering of trees and crops is being justified by the quest for a ‘bioeconomy’, too. It is time to ask ourselves: are the risks worth it? 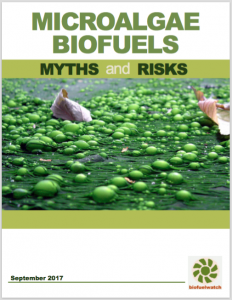 Released in partnership with Friends of the Earth U.S., this report reveals that even after decades of investment, viable commercial production of algae biofuels has failed and is unlikely to succeed. Meanwhile, genetically engineering microalgae to produce fuels, chemicals and other products poses under-recognized, serious threats to the environment and public health. Click here to read the report, and click here for a companion briefing. Algenol is a Florida-based biotechnology company that has received considerable attention as one of the supposedly most promising algae biofuel startups, receiving $35-50 million in grants from the US government. 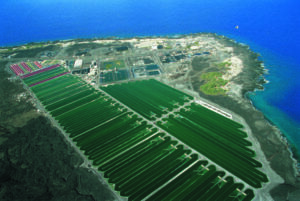 However, after facing significant economic and technological hurdles to commercialization, the company shifted to producing algae products for food and fertilizer. Click here to read the report. 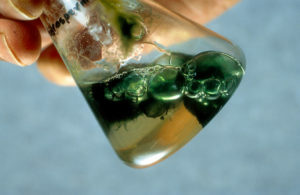 TerraVia (formerly Solazyme) is a California-based algal oil company that received $22 million from the US government to produce algae biofuels. The company is now producing food and nutritional products after operating at a consistent financial loss for years. Click here to read the report. Mascoma is a synthetic biology company based in New Hampshire which received at least $100 and possibly over $155 million from the US government for cellulosic ethanol refineries that were largely never built.Click here to read the report.